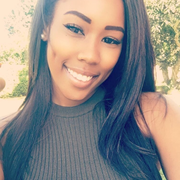 My name is Ayana Taylor, I am 22 years old looking to become a nanny! I live in North Miami, Florida but I am willing to travel. I have been babysitting for 3 years. My very first family had one child at the age of 3 and my second family had 3 children! I am First Aid and CPR Certified. I drive safely and have a clean driving record. I have worked for the City of North Miami Beach Parks and Rec. since I first turned 16, so i have spent plenty of time watching after children and ensuring their safety. Ayana doesn't have any reviews yet.